Wood ear fungi (Auricularia auricula-judae) are a type of edible jelly fungus known for their crisp, snappy texture. Wakame seaweed, has a similar texture as well, so I paired the two together with hearty cannellini beans and mixed mushrooms. 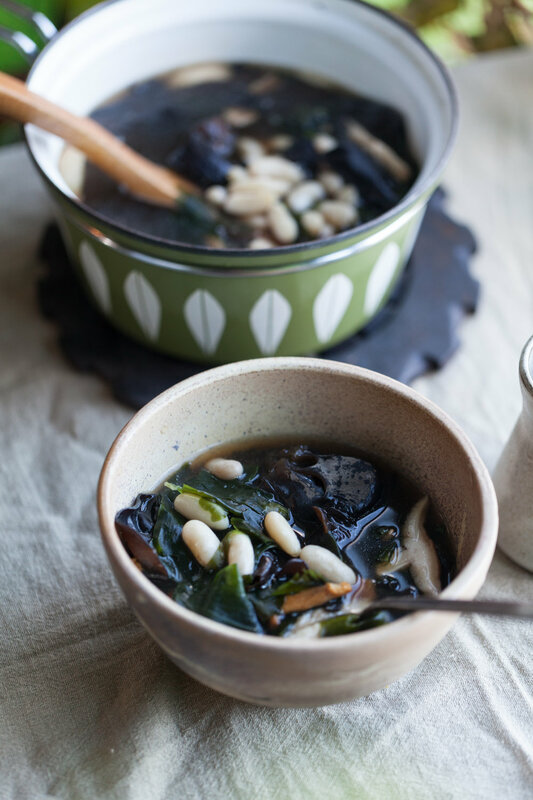 Both the wakame seaweed and the wood ear mushrooms give this soup an unbeatable texture. Add the broth, ginger and tamari sauce to a medium saucepan and boil over high heat for 2 minutes and bring to a simmer. Add the cannellini beans. While soup is simmering, rehydrate the wakame by placing in a bowl of water for 2 minutes. Add the wakame and the mushrooms to the broth and let simmer for 2 more minutes. Serve.